Along with the renaming of “INA - Drives & Mechatronics” (IDAM) to “Schaeffler Industrial Drives”, the direct drive specialist headquartered in Suhl is presenting a new series of ironless linear motors. The UPLplus series has been developed for special sectors in automation engineering, such as analytics in medical technology, production, measurement and inspection machines in productronics, and air bearing axes. New analysis methods in medical technology have increased the need for compact, precise and dynamic motion systems at attractive prices. In productronics, improving the dynamics of drives to further reduce the cycle times of production facilities is still the major development goal. In all of these applications, the maximum acceleration of drives is limited by the relatively large proportion of the rotor mass in the total moving mass. The most important development goal for Schaeffler Industrial Drives’ new UPLplus series was therefore to reduce the mass of the primary part without compromising drive force. Forcer coils printed on a circuit board made it possible for the development engineers in Suhl to develop particularly lightweight primary parts. 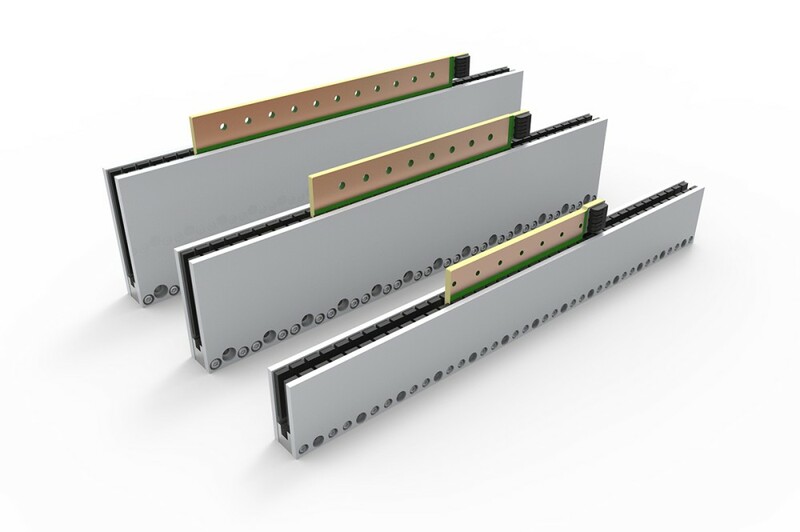 The innovative design of UPLplus linear motors thus offers an improvement of up to 45 percent in the force to mass ratio compared to similar ironless linear motors on the market. Schaeffler’s engineers also reduced the mass of the secondary parts, which has a positive effect on the acceleration capability and positioning time of multi-axis systems. In pilot projects, the new UPLplus linear motors allowed smaller sizes to be used in existing applications (axes) while meeting the same performance requirements. This allowed the use of smaller profile sections of the motion axes and the reduced total mass resulted in a further significant increase in the level of acceleration. At the same time, the throughput of machines was increased. Linear axes with UPLplus motors achieve an average increase in performance density of up to 40 percent compared to similar linear motors from other manufacturers. The new series will be available in three sizes with active part heights of 30, 60, and 80 mm and up to five primary part lengths from the second half of the year. Peak forces range from 120 to 1,450 N and nominal forces from 30 to 300 N. Parallel arrangements are possible if the force range is to be extended in an axially restricted design envelope. The drives can be easily adapted to any type of adjacent construction due to their simple design with a U-shaped secondary part, and are available in lengths from 90 to 390 mm. Due to the U-shaped secondary part, the attracting forces cancel each other out towards the guidance system. This makes it particularly easy to implement systems with air bearings. The UPLplus motors are designed for operation with all conventional frequency converters and at the corresponding intermediate circuit voltages. This ensures that they can be easily integrated into a wide range of drive systems.